Outstanding contributors write on their areas of expertise, making Cardiovascular Genetics and Genomics for the Cardiologist both authoritative and comprehensive. 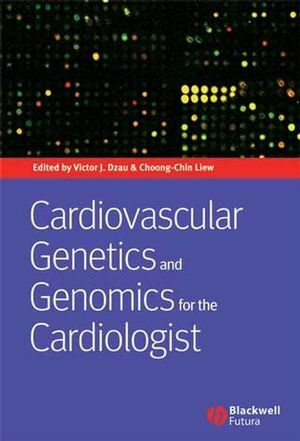 If you want to gain a better appreciation of how genetics and genomics are already shaping current practice and may potentially revolutionize cardiology, look no further than this dependable reference. 1 The gene in the twenty-first century. Choong-Chin Liew, Victor J. Dzau. Part I: Cardiovascular single gene disorders. 4 Dilated cardiomyopathy and other cardiomyopathies. Mitra Esfandiarei, Robert Yanagawa, Bruce M. McManus. 5 The long QT syndrome. Sabina Kupershmidt, Kamilla Kelemen, Tadashi Nakajima. Part II: Cardiovascular polygenic disorders. Päivi Pajukanta, Kiat Tsong Tan, Choong-Chin Liew. 8 The implications of genes on the pathogenesis, diagnosis and therapeutics of hypertension. Kiat Tsong Tan, Choong-Chin Liew. Part III: Therapies and applications. 9 Gene therapy for cardiovascular disease: inserting new genes, regulating the expression of native genes, and correcting genetic defects. Ion S. Jovin, Frank J. Giordano. 10 Stem cell therapy for cardiovascular disease. Emerson C. Perin, Guilherme V. Silva. 11 Pharmacogenetics and personalized medicine. Julie A. Johnson, Issam Zineh. 12 The potential of blood-based gene profiling for disease assessment. "An excellent guide for developing, reviewing, or updating a keen understanding of genetics and its future in medicine. The book should find wide readership."